Everyone here already knows that Glocks are famous for two things: dependability and hardiness. But there’s a third reason why avid firearms enthusiasts like Glocks…customizability. Think of Glocks as the AR-15 of handguns. You can take any Glock straight from the box, break it down, and rebuild it into a different gun altogether. You can even build a “Glock” from the ground up using only aftermarket parts, begging the question: is it still a Glock if it doesn’t have any Glock™ components? Each of these companies has a competitive range of products that can make your factory Glock look great and shoot just how you want it to. You know those action movies where the hero or villain has this awesome customized gun that looks like the Batmobile of firearms? TTI Makes those. You might be surprised to find out that some of your favorite action stars have shot TTI equipment over the years. And while TTI specializes in upgrades for all sorts of different types of guns, dressing up Glocks is one of their specialties…we really love their mag extensions ($34.00). If it’s part of the Glock, chances are that TTI has an aftermarket selection for it. They offer slides, triggers, magazines (and magazine components), sights, guide rods, and more. They also have various gunsmithing packages where they’ll transform your Glock into a performance beast. And since there’s no one-size-fits-all way to design a gun, you’re able to exercise some control over how you want your Glock modified by choosing things like trigger type, stippling, finger grooves, and many other variables. Lone Wolf is one of the most popular and widely used aftermarket Glock companies in the industry. Anyone who’s half of a Glock enthusiast will be able to recognize their iconic “dire wolf” logo at first glance. If it has to do with shooting or hunting, you can bet your last dollar that Lone Wolf has created a product for it. They specialize in gun parts and shooting/hunting gear, but what they’re really famous for is their extensive line of “Glock OEM” parts that allow you to build the 0% Glock, a Glock handgun that has no factory parts. Needless to say, when it comes to standard Glock parts, Lone Wolf has you covered. 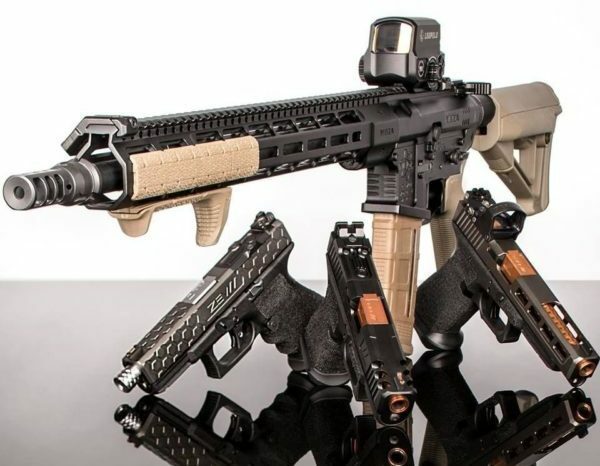 You might also be happy to know that they’ve got a whole range of unorthodox Glock parts to help you build something far beyond the average handgun. One of my favorites is their conversion kits that turn your everyday Glock into a pistol caliber carbine based on the AR-15 platform. Bonus: If you’re looking for more information about pistol caliber carbines, be sure to check our write up from a few months back. If you’re happy with the working parts of your Glock and just want a visual upgrade, Lone Wolf also has a multitude of parts to get your Glock looking the way you want it. They’ve got everything from aggressive slide cuts to loud color schemes, so finding a setup that’s your style won’t be hard at all. If you’re into competition shooting or AR-15 builds, you might already know about Grey Ghost Precision and all of the parts they offer for 5.56mm and .300 Blackout caliber rifles. What you might not know is that the folks over at GGP are also stamping their aggressive skull logo on Glock parts as well. 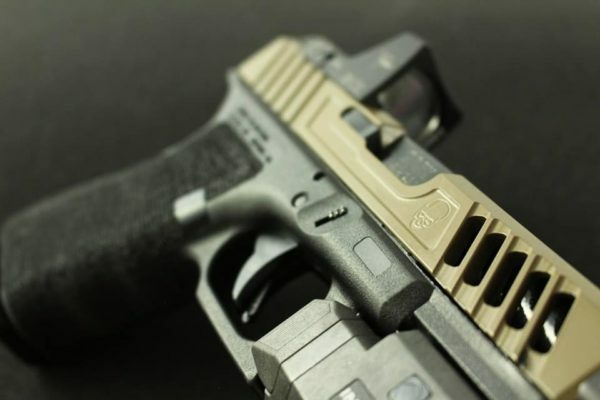 While not as comprehensive as some of the other aftermarket Glock companies, GGP does offer slides and barrels for your Glock 17 and 19 models that really help give your gun an intimidating look. Nice as they look, what I like most about Grey Ghost is their quality. Every slide is made in-house to ensure that they meet the company’s stringent durability and aesthetics standards. They’re also made from high-quality 17-4 billet stainless steel, which doesn’t only give the gun a nice finish – it also keeps your Glock operating as smoothly as it would with a factory slide. In the end, it’s Grey Ghost’s approach to designing products that places them a step above other aftermarket Glock manufacturers out there. 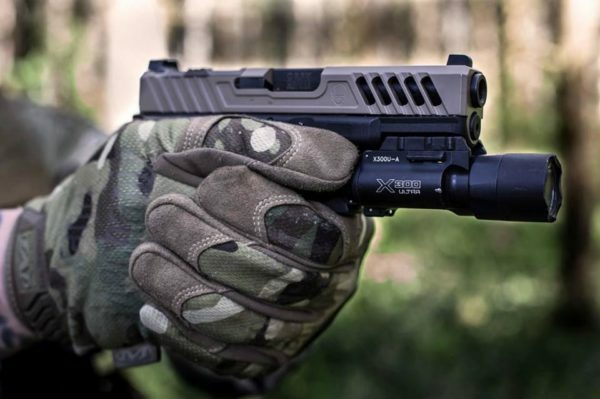 Instead of creating generic Glock slides, they went the extra mile and consulted with law enforcement officers and military personnel to find out what they did and didn’t like about their favorite handgun slides. This helped the company come up with parts for the G17 and 19 that did more than just looked pretty, they improved functionality as well. 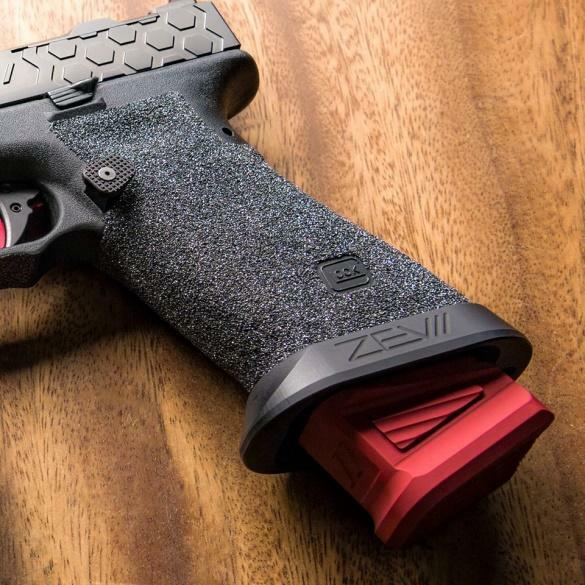 Zev started off as a company that designed replacement triggers for competitive shooters. 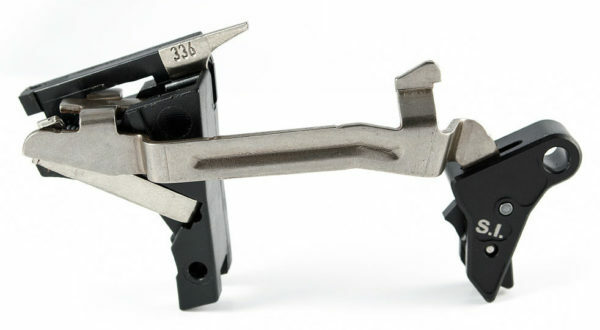 Probably one of their biggest claims to fame was being the first company to come up with a drop-in trigger for the Glock. 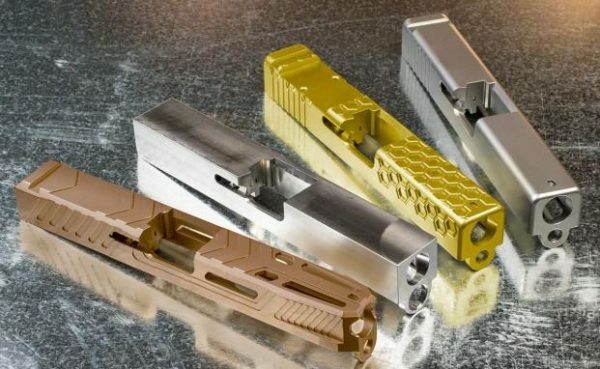 They’ve long since expanded their operation, helping countless hobbyists and competitive shooters turn their factor Glocks into finely-tuned instruments with a wide range of slides and accessories. When it comes to slides, magazines, and barrels, Zev pulls out all of the stops. Their parts are known for having aggressive cutouts and flashy colors, giving them a real Hollywood-like look. One of the things that I love the most about Zev is how they can completely transform the way your gun looks. But they actually do it so well that I feel like my Glock becomes too pretty to shoot. If flashiness isn’t your thing, Zev’s still got you covered. They’ve got traditional looking parts as well so that your Glock doesn’t look like a gun from the movie Transformers. Some of the components you can get are strikers, springs, barrels, sights, guide rods, and mag releases. But the best part about Zev isn’t their superficial upgrades, it’s their triggers. While I personally like Glock’s factory trigger system, some people feel that Glock’s triggers have an almost spongey feel to them. 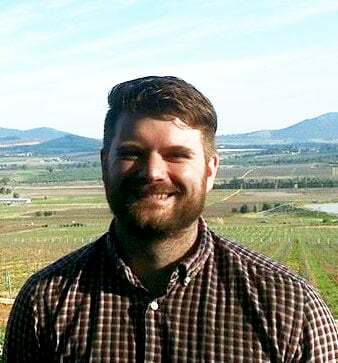 Zev fixes this problem by developing a range of triggers designed with competitive shooters in mind. What you get when you switch to their system is smoother trigger stroke with minimal reset. What do you guys think of Zev? If you’ve read our rundown of aftermarket Glock slides, you might remember that Suarez specializes in creating RMR-ready slides that enhance your Glock’s tactical look. While this is certainly what the company is famous for, they’ve also got a more extensive range of aftermarket packages that will turn your average Glock into an enhanced pistol. One of my favorite services from Suarez is their “Gunfighter” gunsmithing packages, where they take your gen3 and gen4 pistol and give it a complete overhaul. 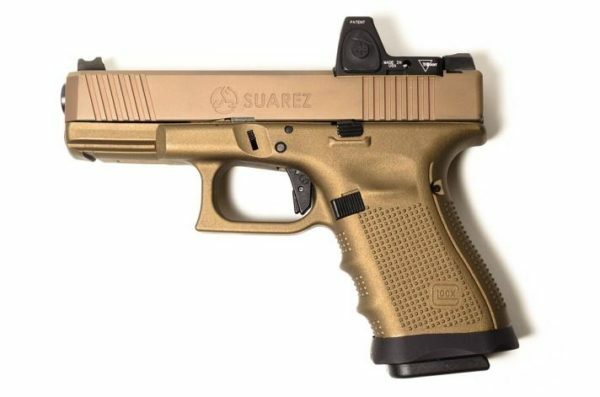 What’s cool about Suarez’s gunsmithing packages is how they place you in the driver’s seat, letting you pick and choose how you want your Glock modified. Not only do you get to pick the finishing of your slide, you also get to choose the barrel, trigger, sights, texture, and even whether you want an optional optic or not. With that said, these upgrades ain’t cheap. They usually run between $1200 to $1600 depending on the package and premium accessories. If having your Glock completely gutted and rebuilt isn’t something that you’re interested in, you can also pick and choose from Suarez’s other aftermarket Glock parts. They have match-grade barrels, triggers designed to emulate the 1911 trigger system, and other upgrades for your Glock. Faxon is new to the Glock game, but their barrels have taken the game by storm! We’ve reviewed a lot of Faxon barrels, including their very popular AR-15 Gunner and Pencil profile barrels. We’ve also done an in-depth review of their Glock barrels and we have to say – these are nice! If you’re looking for an awesome look barrel, a match grade accurate barrel, and one rugged enough to stand up to duty use – Faxon is what you’re looking for. Part of owning a Glock is being able to take advantage of all the aftermarket parts available so that you have at your disposal. 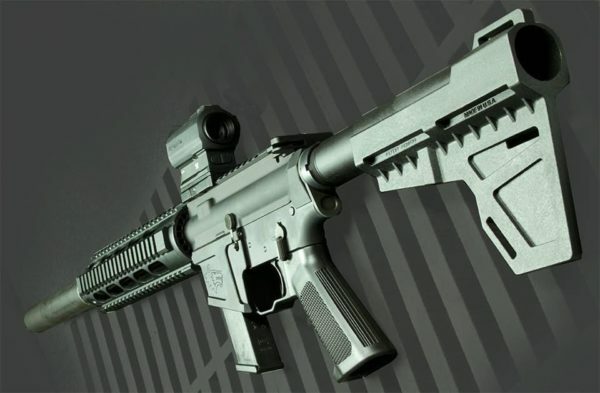 If you’re new to the whole gun scene or you’ve never been big on modding before, you might want to check out our comprehensive guide on gunsmithing to help you get an idea what you’re in store for. 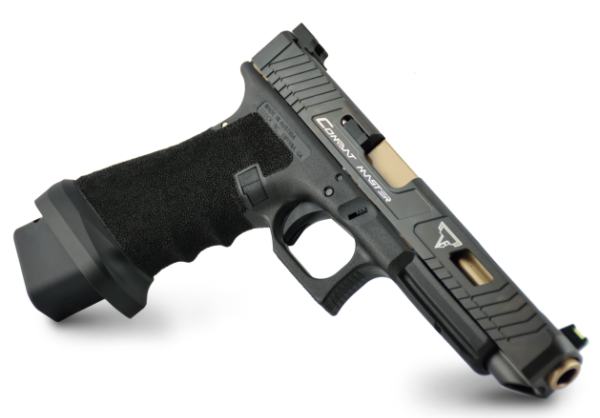 With all the companies out there making aftermarket Glock parts, you can easily design a one-of-a-kind handgun that nobody else has. And that’s what I love about Glocks. If you’re no stranger to customizing and upgrading Glocks, feel free to share some pictures or tell us what you’re working with! GlockParts.com is also one of the good seller of aftermarket and OEM products for Glock. what do you think about hyve products. not exclusively glock though. interested to know your opinion.